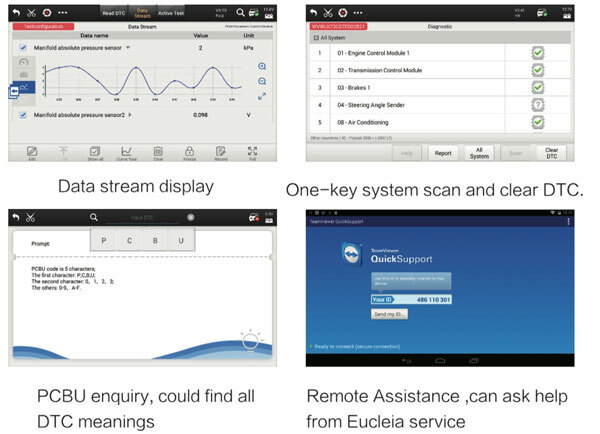 EUCLEIA Tabscan S8 Combined with diagnostic device. J2534 and PDU programming tools. S8 J2534 PDU Programming System Support multi-languages. it is the best choice for working shops, garages, auto service & stations,etc. TabScan S8 is an innovative high-end diagnostic scanner which invest one million RMB in mold, strict IP65 industrial design to enhance the stability. Combined the third-party diagnostic device,J2534 and PDU programming tools which achieved the multi-purpose, multi-connected, powerful dual-mode vehicle diagnosis. 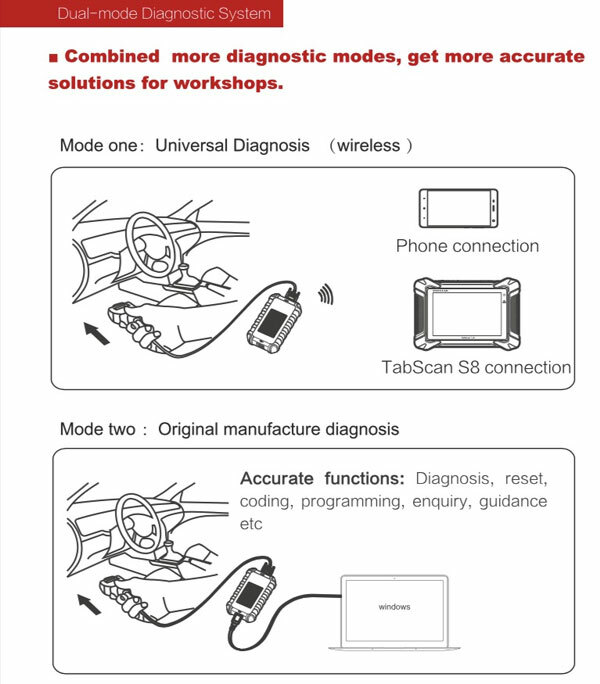 With the TabScan S8 coming into market, it identifies new diagnostic experience and cost performance, it is the best choice for working shops, garages, auto service & stations, etc. Numerous brands, accurate diagnosis, coding,on-line programming, date searching etc. Top one hardware equipped: 8GHz quad-core, 4GB RAM, 32GB onboard memory, 8" IPS touch screen, 1280x800 pixels, 7600mAh Lithium-polymer. More Reliable Hardware: 1 million RMB invest, million times deeper test, strict IP65 design for drop proofing, water proofing and dust proofing. ABS Bleeding, Battery Matching, CVT Reset, CKP Learning, Immobilizer, Oil Service, EPB Reset, TPMS, Throttle Reset, SAS Reset, SRS Reset, RCMM, DPF Reset，head light matching, injector programing, windows initialization study, Air suspension matching, seat matching, language change, tire modified. Brush hidden functions: supported For Audi, For VW, For Skoda, For Seat. Numerous brands, accurate diagnosis, coding, on-line programming, data searching,guidance etc.